Welcome to The Daily’s photo blog: Captured. This will be a space to share photos by The Daily’s staff as well as photos from members of our community. Students can submit entries to be considered from their classes, vacation or just from around NU by emailing photo@dailynorthwestern.com. 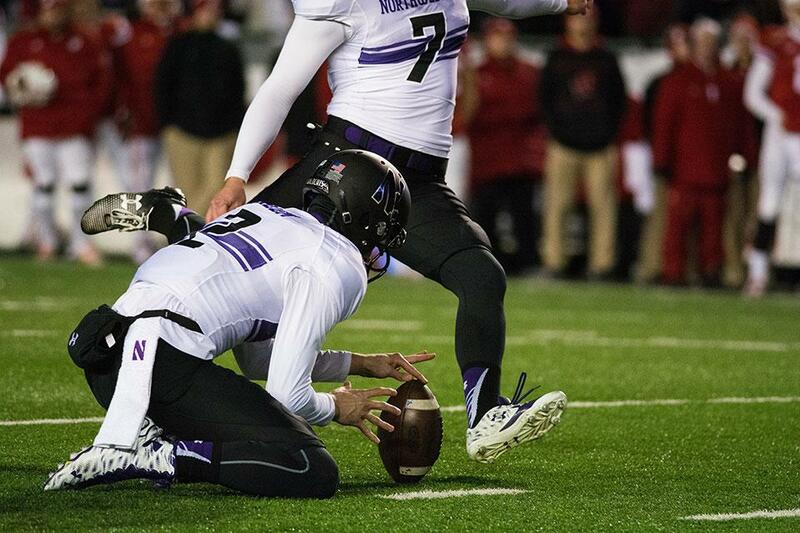 MADISON, Wis. — Once again, the game came down to the final seconds for Northwestern. The No. 20 Wildcats (9-2, 5-2 Big Ten) weathered a wild one to beat the No. 25 Wisconsin Badgers (8-3, 5-2) 13-7. NU survived two would-be touchdowns that were overturned on replay in the final minute of the game before forcing an incompletion on the Badgers’ final pass attempt. The improbable victory was the Cats’ first win in Madison since 2000. 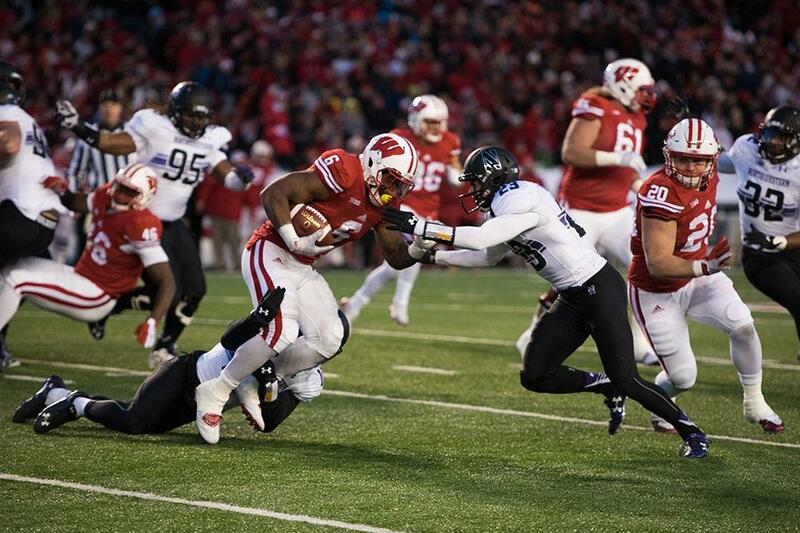 Justin Jackson falls to the turf during Saturday’s game against Wisconsin. 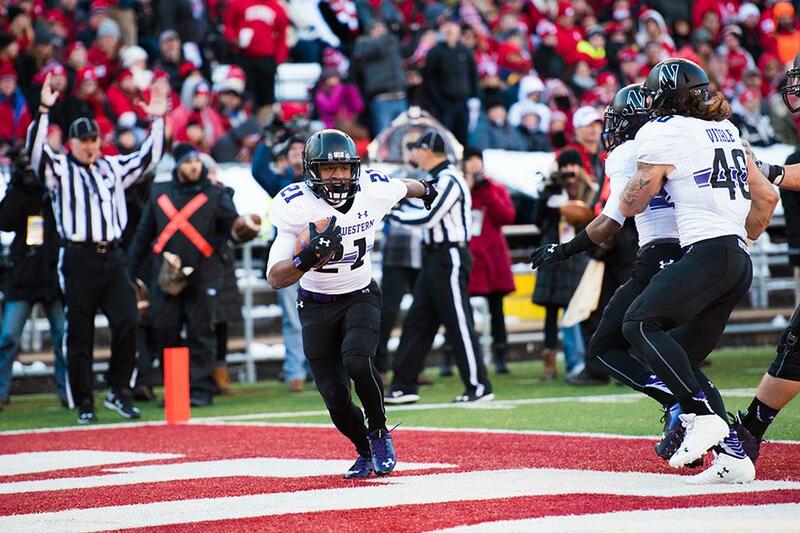 The sophomore running back rushed for a game-high 139 yards in the Northwestern win. Holder Christian Salem sets up for a Jack Mitchell field goal. Mitchell, a junior kicker, converted a key field goal in the fourth quarter Saturday after missing two kicks earlier in the game. 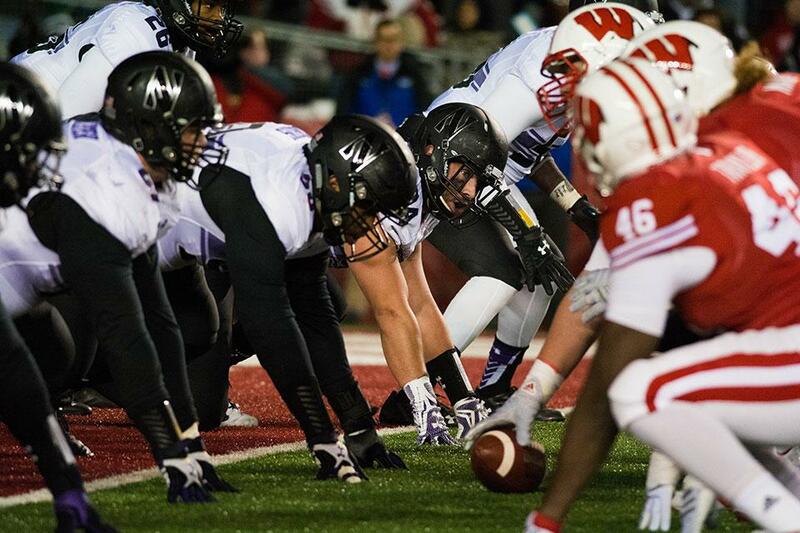 The Northwestern defensive line sets up at the one-yard line during the fourth quarter of Saturday’s game. The Wildcats stopped Wisconsin inside the 10-yard line on the Badgers’ final possession. 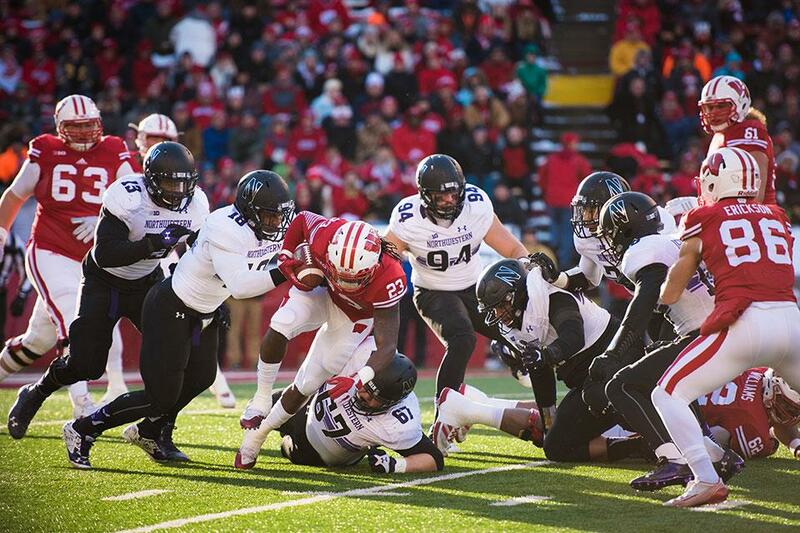 Several Wildcats defenders team up to bring down Wisconsin running back Dare Ogunbowale. Northwestern’s defense, and its defensive line in particular, carried the team in Saturday’s win. 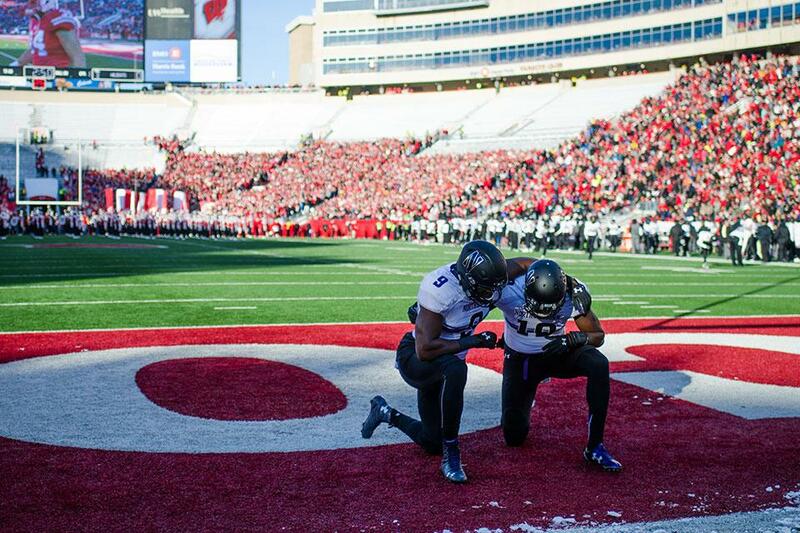 Justin Jackson celebrates in the Wisconsin’s end zone in the first quarter Saturday. The sophomore running back scored Northwestern’s sole touchdown of the day with an eight-yard run. 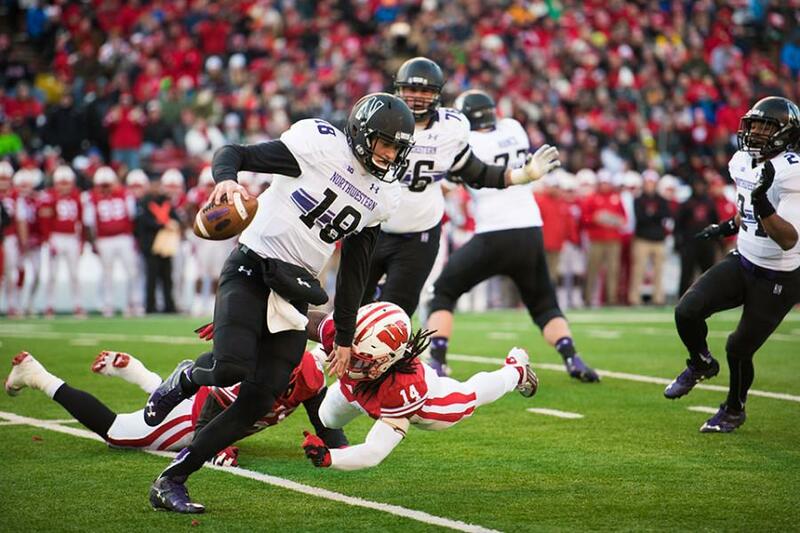 Quarterback Clayton Thorson skirts past Wisconsin players while rushing on a play. The redshirt freshman carried seven times Saturday for seven yards. 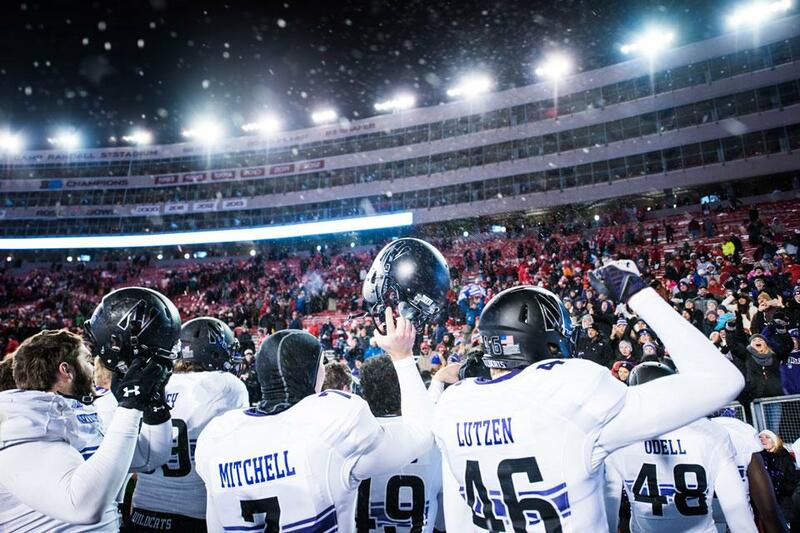 Wildcats players sing the fight song in front of traveling fans at Camp Randall Stadium. 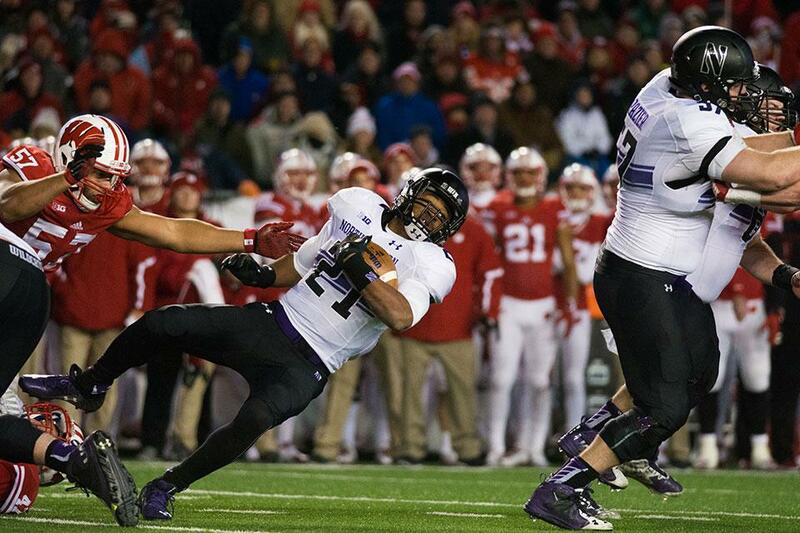 Northwestern’s win over Wisconsin on Saturday was the team’s fourth straight. 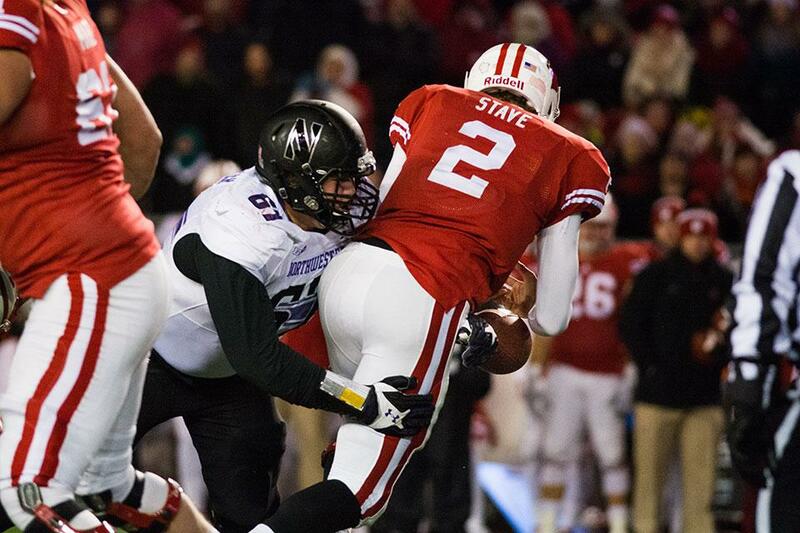 Sophomore defensive tackle Tyler Lancaster forces a fumble on Wisconsin quarterback Joel Stave. 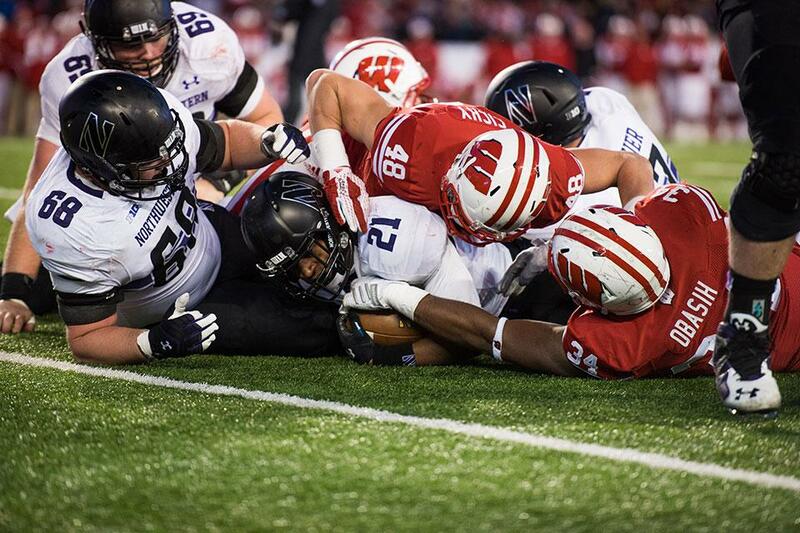 The Wildcats’ recovered three Badgers fumbles Saturday. 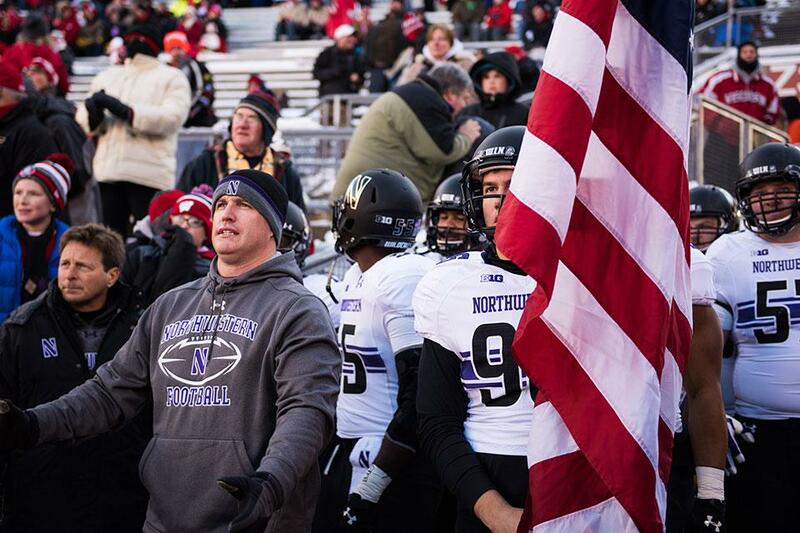 Coach Pat Fitzgerald stands with his players before Saturday’s game against Wisconsin. “I’m still kind of speechless,” Fitzgerald said minutes after the dramatic 13-7 win. Godwin Igwebuike collides with Wisconsin running back Dare Ogunbowale. The sophomore safety had five tackles in Saturday’s game. Redshirt-freshman linebacker Nate Hall contests a Wisconsin pass late in the fourth quarter of Saturday’s game. 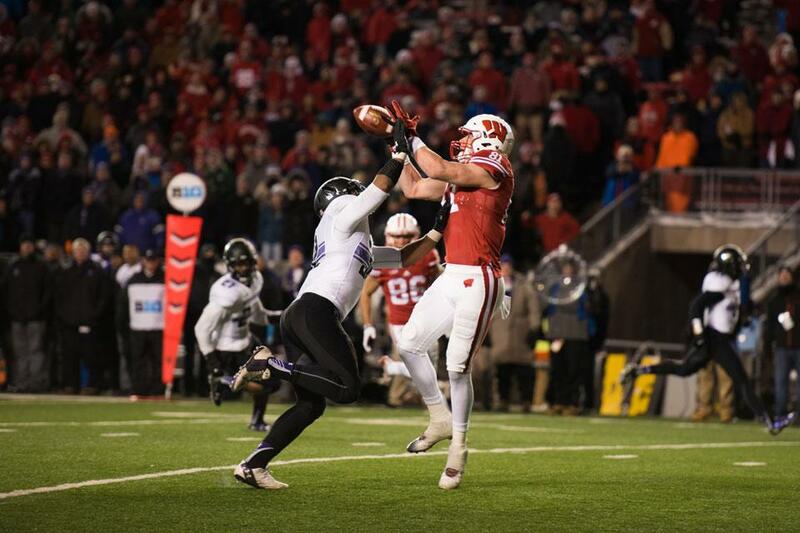 The Wildcats stopped the Badgers short of the end zone to preserve a 13-7 victory. Quarterback Clayton Thorson lines up a pass. The redshirt freshman threw for 60 yards on Saturday. Brothers Garrett and Cameron Dickerson kneel before Saturday’s game. 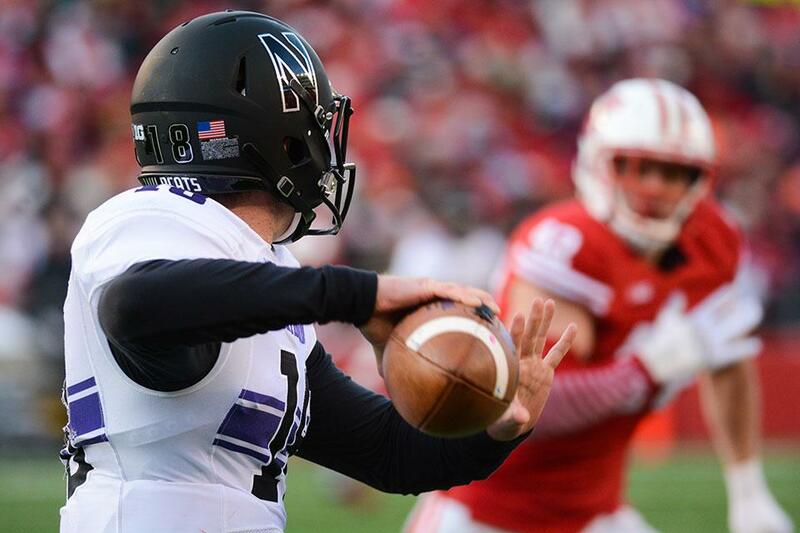 Garrett Dickerson tallied 24 of Northwestern’s 60 receiving yards. 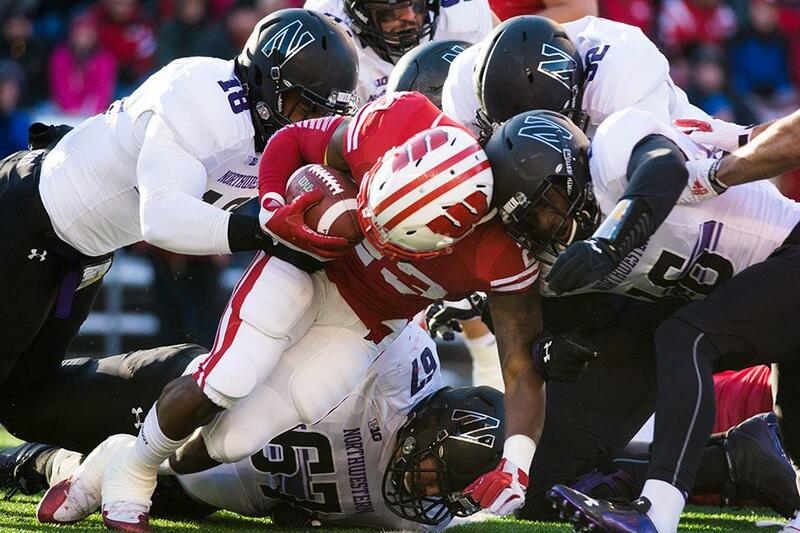 Northwestern defenders attempt to tackle Wisconsin running back Corey Clement. Clement carried 10 times for 24 yards Saturday. Sophomore running back Justin Jackson lays on the turf Saturday following one of his 35 carries. Jackson scored Northwestern’s only touchdown of the game, in the first quarter. 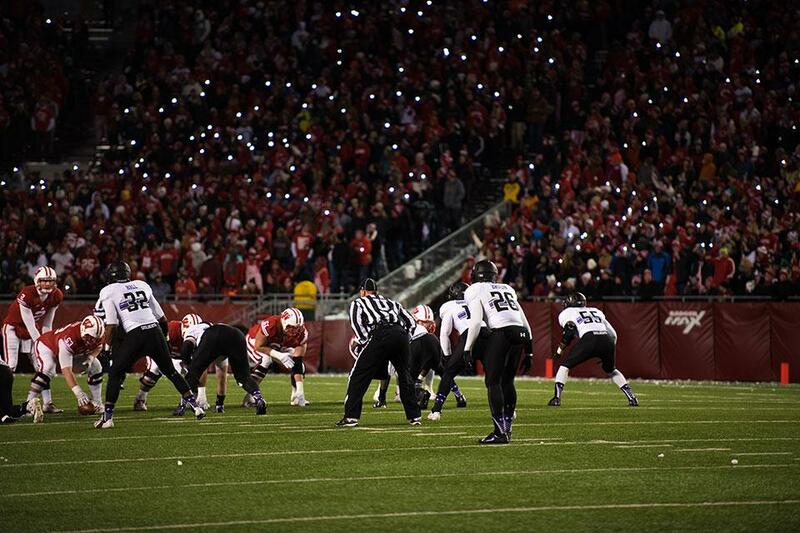 Northwestern’s defense lines up beneath a sea of cell-phone lights during the second half Saturday. The Wildcats forced five Wisconsin turnovers on the afternoon. 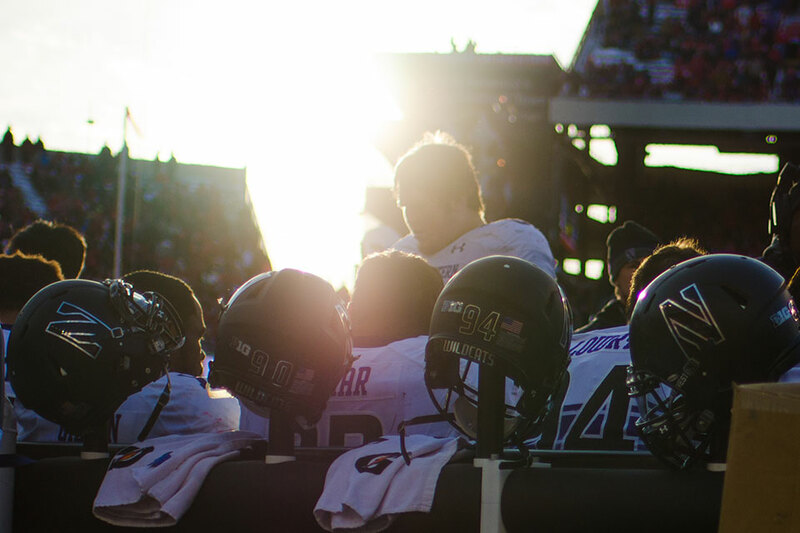 Northwestern helmets wait behind the team’s bench during Saturday’s game against Wisconsin. 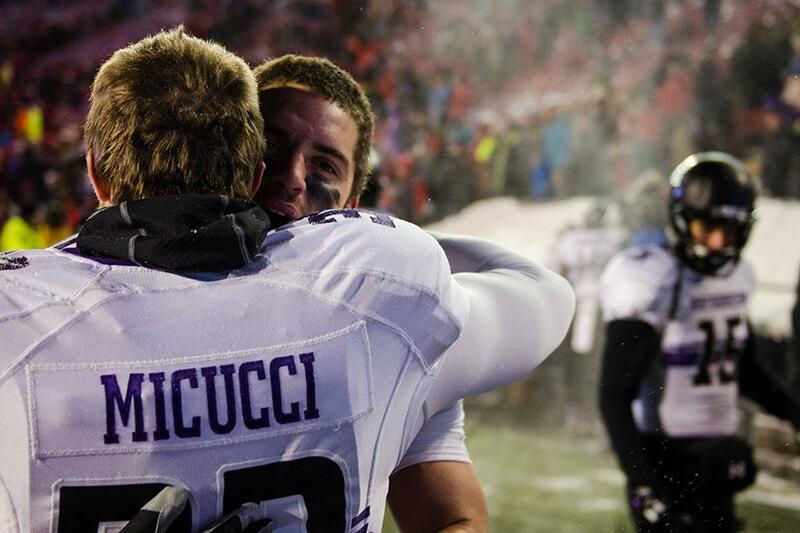 Two Northwestern players hug following team’s win over Wisconsin on Saturday. The Wildcats’ victory was their first over the Badgers in Madison since 2000.